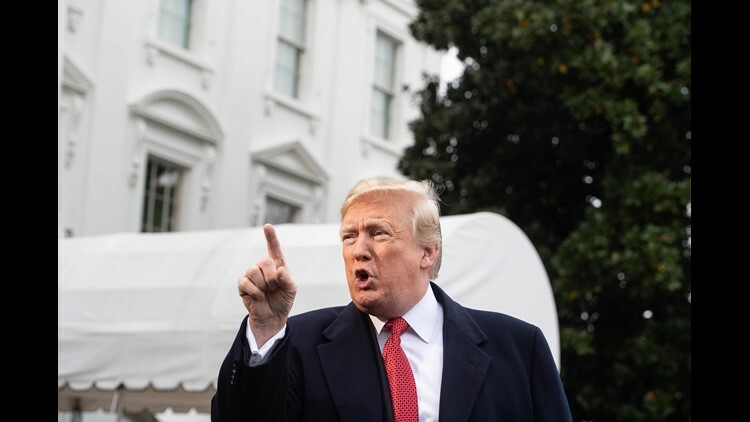 WASHINGTON – Days after appointing Matthew Whitaker as acting attorney general and assuring the country that he was capable replacement for the ousted Jeff Sessions, President Donald Trump Friday claimed not to know his new Justice Department chief. "I don't know Matt Whitaker," Trump said just before departing for France to commemorate the 100th anniversary of the end of World War I. "Matt Whitaker has a great reputation, and that's what I wanted." Trump's remarks directly contradicted comments he made a month ago when he heaped praise on Whitaker. "I can tell you Matt Whitaker's a great guy," Trump said in an interview with Fox News. "I mean, I know Matt Whitaker." The president's most recent comments appeared to be an attempt to distance himself from Whitaker. The former Iowa federal prosecutor's past criticisms of Russia special counsel Robert Mueller have drawn new scrutiny since his Wednesday appointment, prompting calls for his recusal from overseeing the inquiry into Russian interference in the 2016 election. As acting attorney general, Whitaker would oversee the work of Mueller's team, a task that had fallen to Deputy Attorney General Rod Rosenstein after Sessions recused himself last year. Despite repeatedly casting doubt on the inquiry, Whitaker, Sessions' former chief of staff, has given no indication that he intends to recuse himself from it while acting attorney general. Trump claimed Friday that he had no contact with Whitaker regarding the Russia investigation, which the president has derided as a "witch-hunt." "I didn't speak to Matt Whitaker about it," Trump told reporters on the White House lawn. "When Sessions left, what I did, very simply, is take a man who worked for Sessions," the president said. "He's a highly respected man, especially by law enforcement. And I think he's going to do a great job." Democrats and some Republicans, citing Whitaker's past criticism of Mueller's inquiry, have expressed serious concerns for the future of the Russia investigation in wake of the Justice leadership shakeup. Meanwhile, legal analysts, both liberal and conservative, have raised questions about Whitaker's very authority to serve as an interim attorney general because he has not been confirmed by the Senate. Citing the criticism of Whitaker's standing, Trump took aim at Mueller. During his morning exchange with reporters, Trump also criticized predecessor Barack Obama and ex-first lady Michelle Obama, who has written a book in which she criticized Trump for questioning her husband's U.S. birth. "Michelle Obama got paid a lot of money to write a book and they always insist you come up with controversy," Trump said, before turning to attack the former president. "I'll never forgive him for what he did to our United States military by not funding it properly." Actually, military spending reductions in earlier years resulted from bipartisan congressional decisions on budget caps. During his trip to France, Trump is expected to meet with French President Emmanuel Macron, and may speak briefly with Russian President Vladimir Putin.